This is Wally Berg calling in from Kathmandu. Mark Keleher arrived yesterday and was taken to the Yak and Yeti by Mingma from Peak Promotions while Wongchu and I were running around Kathmandu getting things in place for the upcoming BAI Ama Dablam expedition and our Everest Base Camp trek. I think he enjoyed prowling the streets of Kathmandu on his first afternoon here. It was good to meet him and make plans for today’s program. We left the Yak and Yeti in a nice new Toyota 4 wheel drive that Wongchu sent over for us. We drove to out of the Kathmandu traffic into the rural part of the Kathmandu Valley and beyond to the beautiful, green terraced countryside just west of town. At the village of Salle Danda we made a visit to a school being funded by Room to Read. What an amazing experience it was. This school is five rooms. Some of the rooms don’t even have a roof over them yet. However, it is going to be a very suitable building once the Room to Read project is completed. It is already an operational school but the students are anxiously anticipating the improved conditions and especially the new books Room to Read will be providing. This village is an area that most people are mostly Brahmin and Chetris Nepalese people. Mingma, of course, is a sherpa. There was a very touching time to walk into the midst of these poor children who had garland and wreaths of flowers hung on their necks. We were presented with tika or Hindu paint on our faces, and soon we too were quite colourful. We stood around and enjoyed the view, the scenes with the children and school teachers. There was a great deal of pride in the project, which will soon include a much improved building and a new library. Mark presented the head master with a book about San Francisco where he and John Wood and many other people who are closely involved with Room to Read live. We really enjoyed the beautiful view from this school yard. Later we trekked to another school in the area at Dharke Jeepenpur. This school was built about one year ago, also with money from The Room to Read. While we were there we met a really interesting couple from United Kingdom, Douglas and Francis who were volunteers at the school along with the Nepalese teachers. I should mention that the trekking that we did to reach these schools was classic middle hills of Nepal trekking. We walked through beautiful terraced fields, small villages, small well-kept homes of the Brahman and Chetris people; r ice fields, banana trees, relatively high temperatures, flowing streams all about, really beautiful trekking. We got back to the road and we returned to Kathmandu. The Yak and Yeti felt pretty nice as we walked into the reception area. Back at the Yak and Yeti we returned to find that Amelie, Dafna and Steve had been met at the airport by Ram from Peak Promotions and the entire group was finally together. We are going to have a nice meal here in the hotel tonight and tomorrow we will be met by Krishna Dhakal and we will take off for a customary city tour to enjoy the view of the temples and sights inside the Kathmandu Valley. Room to Read is a non-profit organization, which seeks to improve the lives of children by providing them with the lifelong gift of literacy. With existing projects and programs in Nepal and Vietnam and recently expanding to Cambodia and India, they are working with local communities to improve educational opportunities for children. Since their launch in 2000, Room to Read has impacted the lives of over 40,000 children. They have built 25 schools, established 300 libraries, shipped over 100,000 books and provided over 100 scholarships for under-privileged girls. 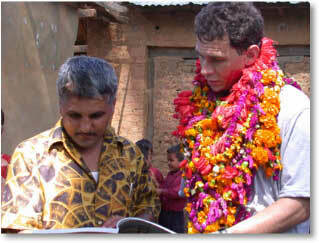 More information is available at www.roomtoread.org.